Rio is a colorful film, above all else. 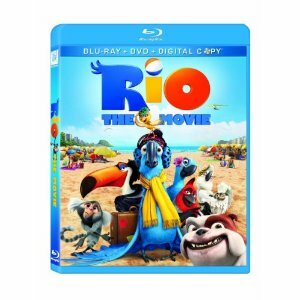 The vibrancy of the color and the inspiration of the music is what makes Rio stand out, though the entire film is rather competently made. The story is simple but works, the voice actors are all effectively utilized, and there are many humorous moments in the dialogue. This is an all-around decent animated family film. Perhaps it is not spectacular or entirely memorable, but Rio is altogether enjoyable nonetheless. Jesse Eisenberg lends his voice to Blu, a domesticated Blue Macaw owned by a bookshop owner in Minnesota. They have a happy existence, but it is one which allows Blu a lifestyle never in need of flight, so he never bothers to learn to fly. This is never an issue until the news comes that Blu is one of two remaining Blue Macaws, and he travels with his owner to Rio de Janeiro in order to repopulate with his female counterpart, Jewel (Anne Hathaway). Jewel is more interested in escaping and flying free, however. She doesn’t want to be kept in a cage, although the value of the last two of a kind is a temptation that brings thieves. Soon Jewel and Blu are forced to run away from the thieves, attempting to find a way back to their own versions of freedom, with the help of many other birds and a dog (Tracy Morgan). The Blu-ray is a three-disc set with a DVD and digital copy of the film as well. The Blu-ray special features include a number of great interactive features, including some dance lessons. There are so many great special features that it even boasts all of the extras when the menu first comes up on the disc. There are featurettes about the music more than anything else, including several music videos. There is also a featurette about the voice talent and a deleted scene.